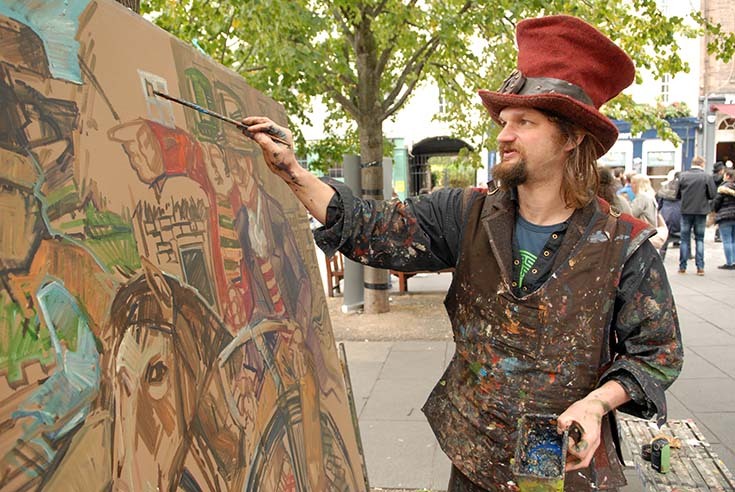 Chris live-painting his Penny Farthing mini mural in the Grassmarket on September 24, 2016. 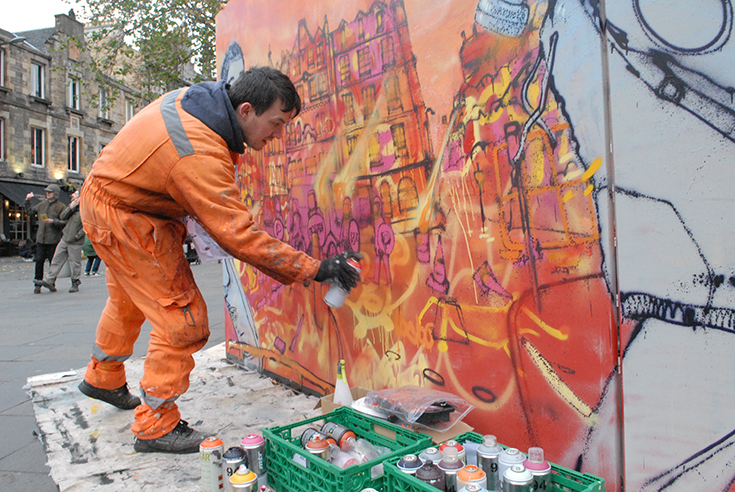 The Greater Grassmarket Business Improvement District is a five-year project (starting February 2013) where all businesses within the defined area have come together to invest collectively to benefit business and local economy growth through local improvements, activities and business support in addition to those delivered by City of Edinburgh Council and Scottish Government. 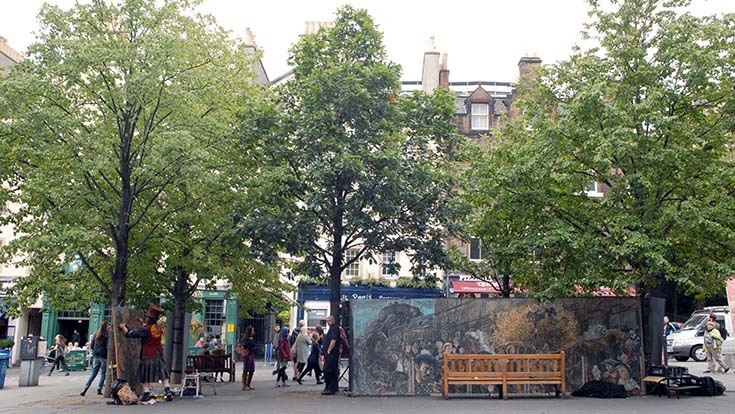 Their objectives include creating a sense of place, attracting more footfall to the area and raising the profile and improving the perception of the area, and I am delighted to be involved in these ambitions. 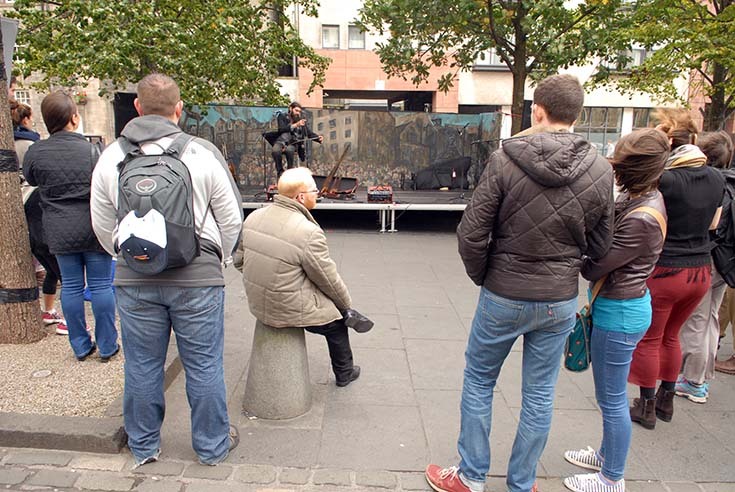 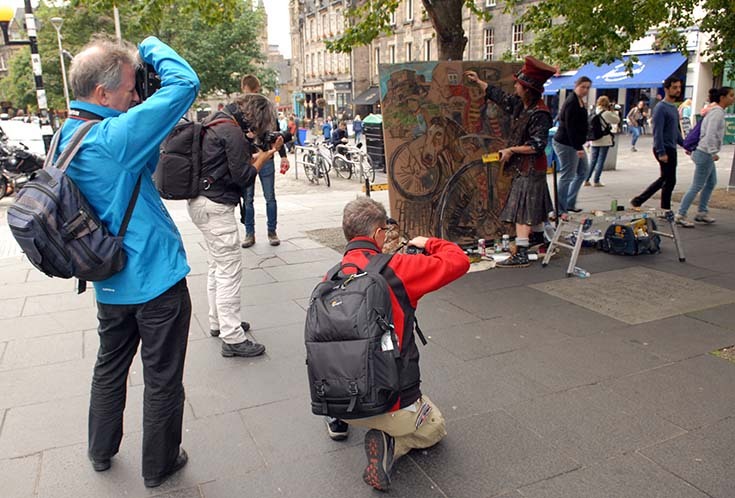 Foreign visitors to Edinburgh capturing Chris’s live-painting event in the Grassmarket. 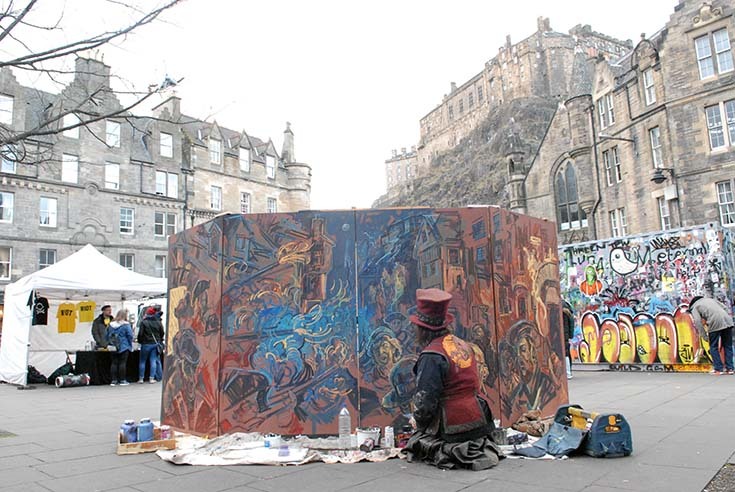 Chris live-painting the Penny Farthing mini mural at left, while his Half Hangit Maggie Dickson mural acts as an appropriate backdrop for the performance stage in the Grassmarket. 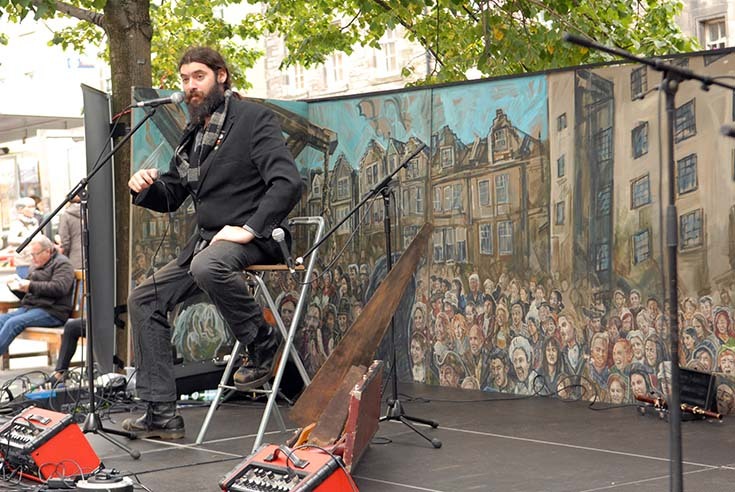 Chris’s Half Hangit Maggie Dickson mural acts as an appropriate backdrop for the performance stage in the Grassmarket. 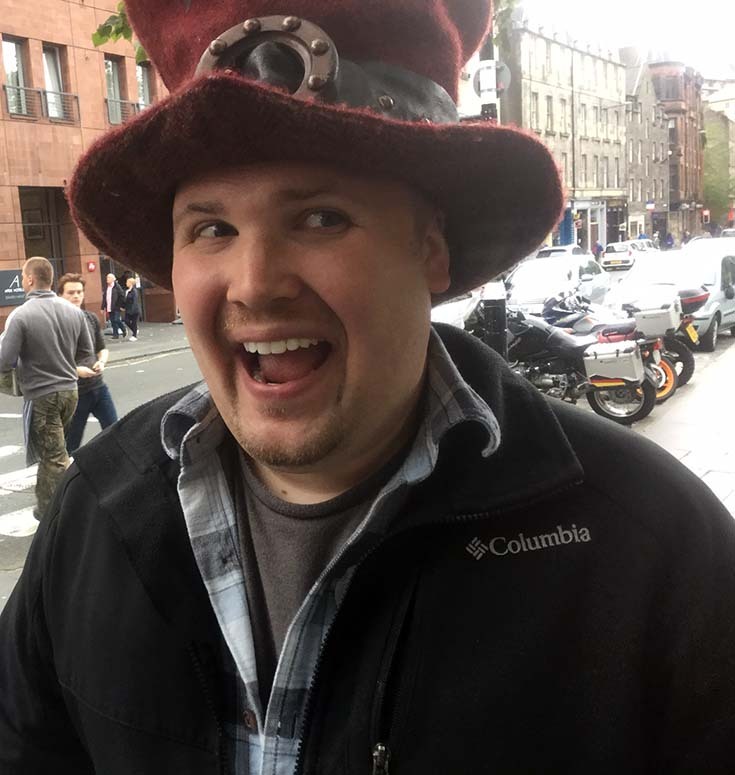 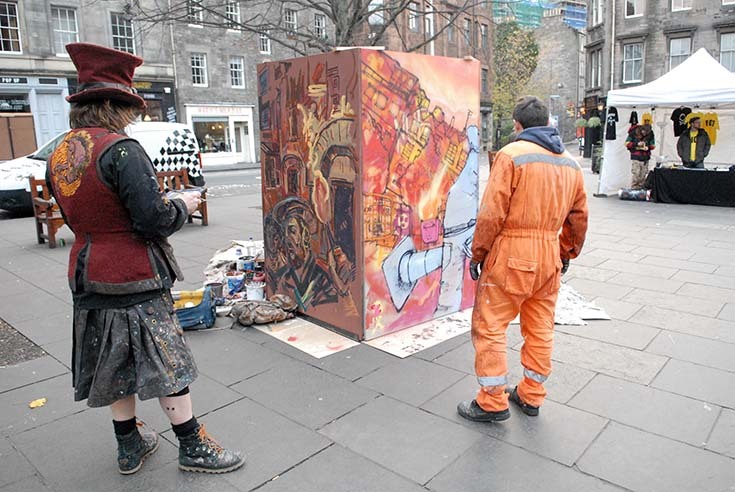 In September of this year, the Greater Grassmarket BID events team led by Callum Ross wanted some extra colour in their proposed ‘Mobility Week’. 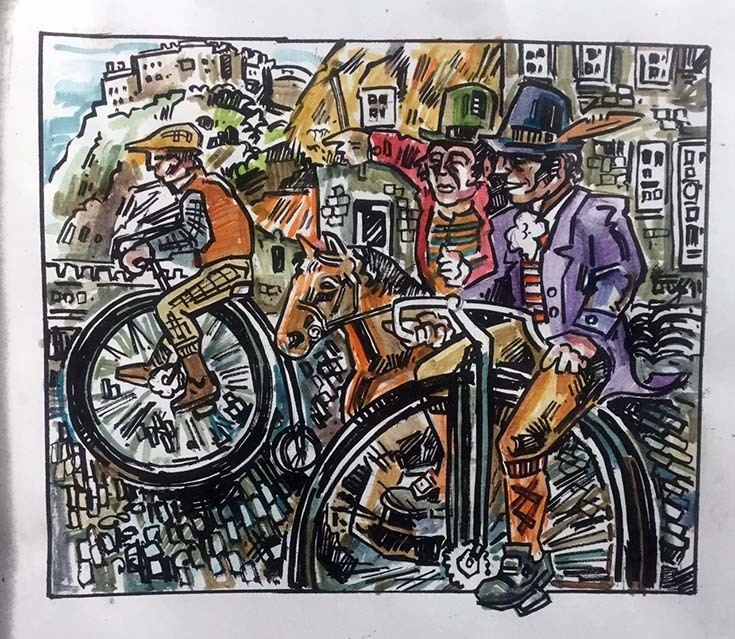 Designed to celebrate mobility in all forms and set it within the historic context of the Grassmarket, they commissioned a diverse group of performers which included musicians, actors and even penny farthing demonstrations running up and down the square. 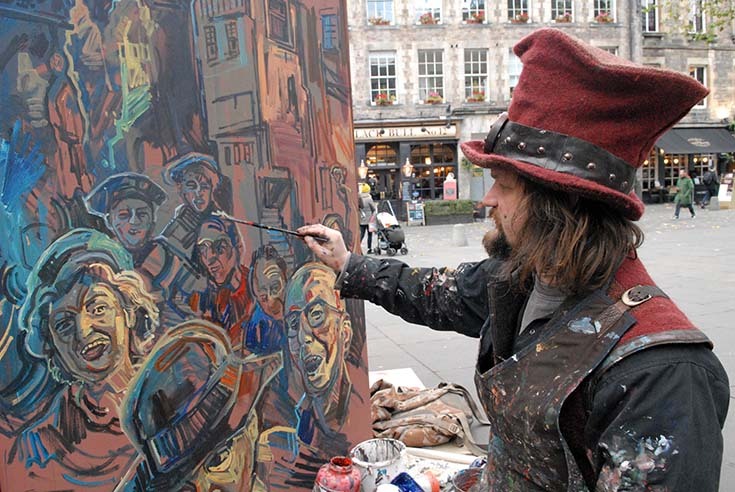 As always I asked visitors at the event to participate as characters in the picture, and they really entered the spirit of the piece. 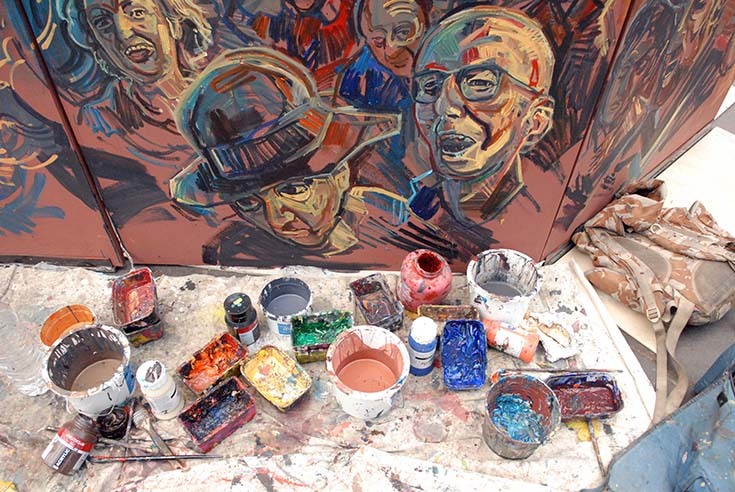 In addition to the new painting, I took my Maggie Dickson mural along and it was used as an evocative backdrop for the performers on the stage beside me. 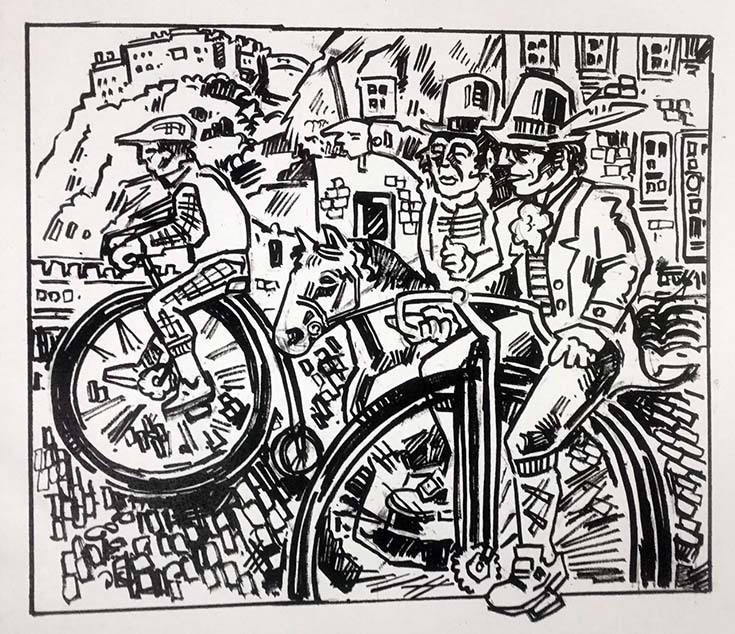 If possible it’s always nice to have some visual context from one of my previous artworks and visitors seem to enjoy seeing other finished pieces. 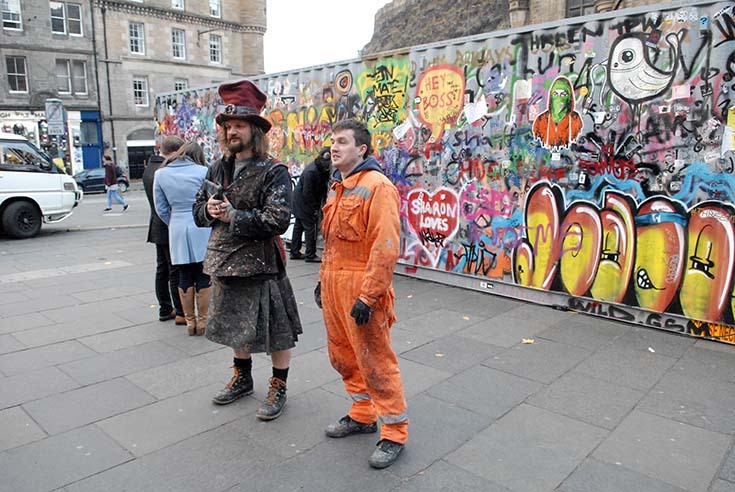 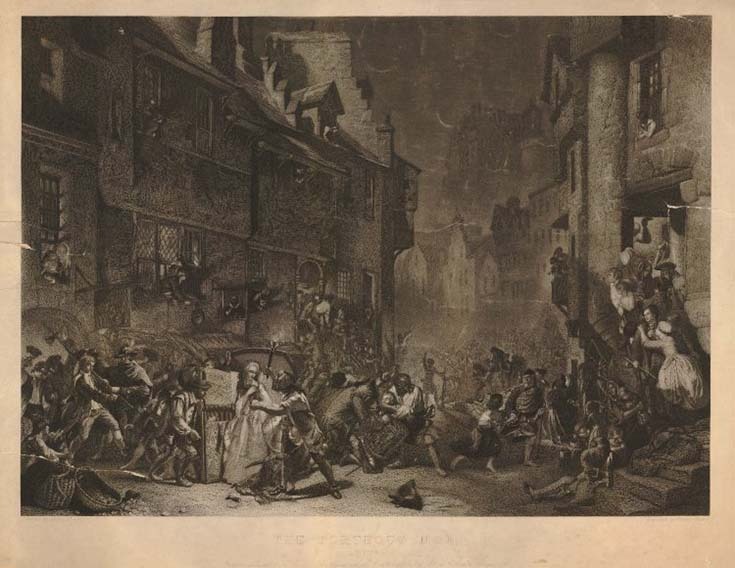 Above: Jason Fricke, an American visitor to the Grassmarket, gets in character – and ends up in the mural (see final piece below). 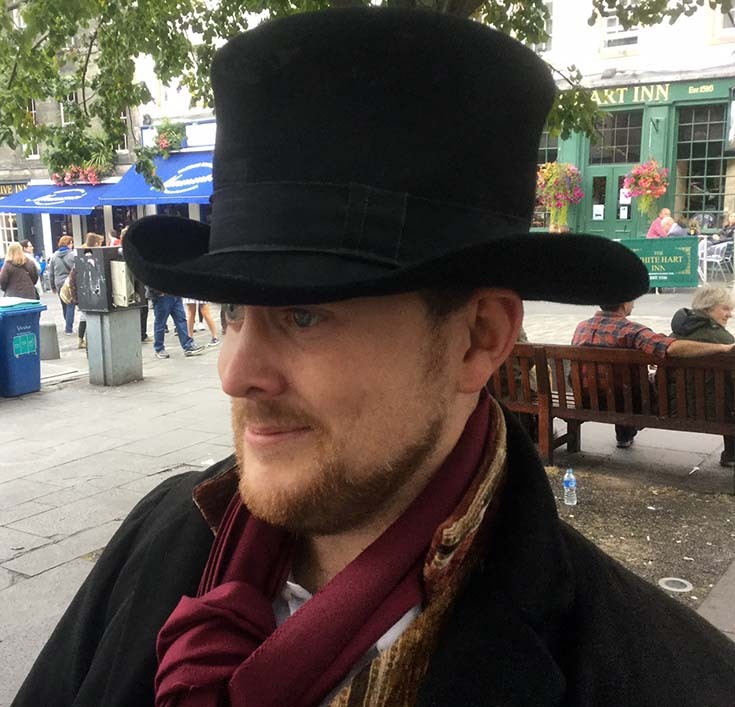 The event was held on my birthday and was a splendid way to spend the day, which was topped off by the best pastry ever delivered by Sheila, my studio manager. 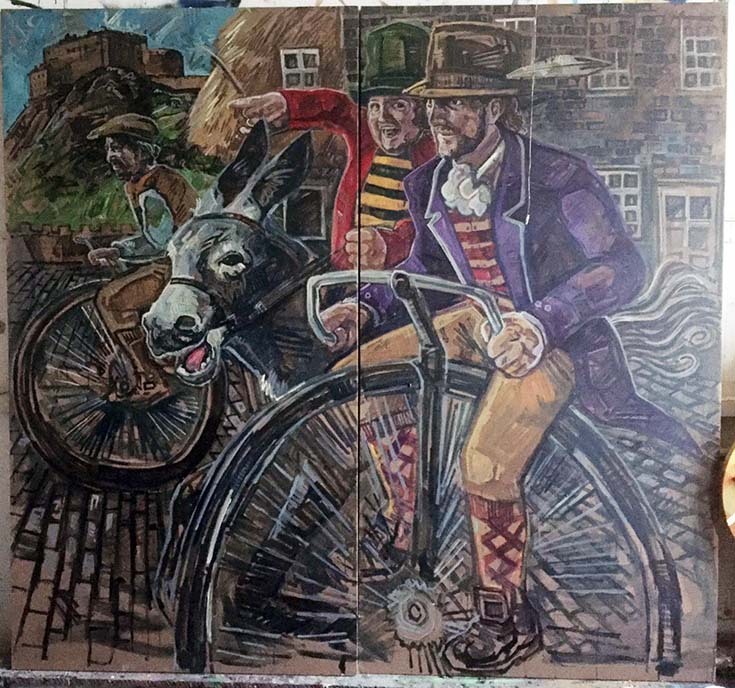 The (almost) finished Penny Farthing mini mural, being worked on back in the studio.